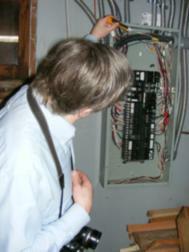 Seattle Home Inspector's Blog: Am I on Candid Camera? Sometimes I truly think that people do things in their home with the sole purpose of seeing how hard they can make the inspector laugh. The following plumbing problem I came across on a recent inspection might make anyone familiar with the installation of dishwasher air gap devices howl out loud. The rest of you will have to laugh vicariously. The dishwasher air gap device prevents dirty water from being drawn back into the dishwasher should the sink and drain flood. Being a sanitary apparatus, keeping effluent out of the dishwasher probably sounds like a good idea. In my humble opinion it is “best practice” to have an air gap regardless of what the code says. If the sink and drain were to truly flood to the rim of the sink and onto the kitchen floor, the level of water is necessarily going to be above any high loop under the countertop---end of story. People’s sense of aesthetics sometimes gets all riled because they don’t like the “look” of the air gap device protruding through their nice granite countertop or sitting on the sink. If it is an under-mount sink there might not even be a place on the sink to mount the thing. Enter: The Johnson Tee. The Johnson Tee is another way to create an air gap without having the abysmally ugly chrome trailer hitch mounted on the not-to-be-adulterated countertop. This apparatus is hidden in the wall and will have a decorative cap that vents to the outside---or sometimes to the back splash---although to the outdoors is typically preferred when possible. Here are a couple of pictures that show what the rough-in of the Johnson Tee assembly looks like with its cap on the exterior. Pretty cool don’t you think? This clearly gets the air gap above the flood rim of the sink and off the countertop. The other day I found the most unusual installation of a Johnson Tee that I have ever seen---I am still laughing out loud to myself! Let’s ask some questions about this installation. Is it above the flood rim of the sink? Will it function to keep dirty water out of the dishwasher if the drain backs up? Will a backed up drain come out of the air gap device and flood the cabinet? Will sewer gases come out of the air-gap device because there is no trap in the drain to prevent it? Like I said, am I on Candid Camera? Charles this is so interesting to me. I don't recall our inspector ever talking about this kind of gap. I've heard the high loop thing countless times. Maybe they don't require this as you mentioned it's a code thing. Scary picture - and maybe you are on Candid Camera!! Anna, as much as home inspectors like to say they are NOT code inspectors---this is only true in a legal sense. In reality most inspectors report according to the conventions of their area---which are code based typically. For me, since the codes are a "minimum" standard when I know a way that is better than the codes I have no problem reporting as such. There are lots of examples of this besides the lowly air gap device. I will have to ask our guy about it.....maybe it's being looked for and I have no idea? Interesting after all the years in the biz and I've NOT heard about it. Our inspector isn't a minimum kind of guy.....he's top notch like you. Charles -- than you for showing us how this should and should not be handled, if you want it to work properly. Anna, so many areas follow one or the other plumbing codes and then some have amendments to those codes as well. Like the water heater TPR valve, that is the soon-to-be-famous EMR valve. That's the Effluent Mushroom Relief valve. It is approved by the MPC (Mushroom Plumbing Code). The mushrooms of the world are happy for the representation. Hmm, interesting. Would this look similar if the sink is in a center island kitchen? Carol, I am not sure of your question but and Island would not affect where this should be placed except that if the dishwasher is not on an outside wall of the house the Johnson Tee would be on the backsplash behind the sink. Too funny and not so funny. There is always a plumber out there with their own design that they try to get by us. Have a good day in Seattle. Charlie, Better to be teed off than teed on ;) Got to love creativity though.